This post is meant as an accompaniment to a more broad ranging lecture that I published under the title “Disordered Systems at the Breaking Point: Materials, Students, and Schools.” In that lecture I started by discussing the work I do trying to understand how metallic glasses, which are very strong, fail when subjected to high stresses. There I gave a brief description of metallic glasses and the way they fail. Ultimately, though, we want to be able to understand and quantify this process scientifically so we can predict it. A brief and hopefully accessible discussion of the basic science behind that question will be the subject of this post. Simulation of ellipsoidal particles in a Lennard-Jones background provided as one of the example simulations for the LAMMPS molecular dynamics simulation code. The real challenge we face is how to describe changes in the structure of a material that is apparently random. We do this all the time when we describe liquids, but liquids have a property of being in equilibrium. That is to say that their properties don’t change on the time scale of the measurements we make. They are also “ergodic,” which means they are continually rearranging their atoms such that given enough time they will explore all, or at least a representative fraction, of their different possible configurations. As a consequence we can describe them without reference to any particular structure since we can imagine that the liquid is a kind of average over all its possible structures. As a result of this averaging the liquid has a unique set of properties. So, if you have a liquid at atmospheric pressure, by knowing its temperature you can predict a whole host of facts about the liquid: its density, viscosity, stability and other things. But glasses unlike liquids are stuck in a particular structure; so such averaging is not generally believed possible. Glasses are said to be out-of-equilibrium. What I have come to believe is that unlike liquids that have properties that depend on a single temperature, glasses may instead have two temperatures. That is to say that all the atomic vibrations in the glass are typically at the same temperature as the surroundings, but the structure of the glass, by that I mean the configuration in which its atoms are bonded together, is described by a different but equally real temperature. 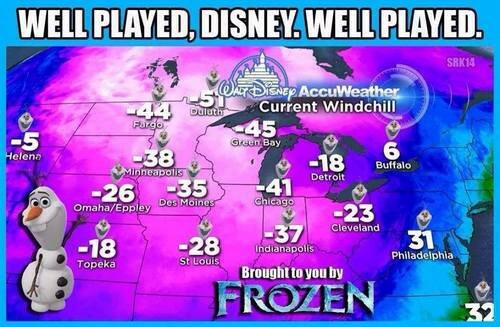 The Polar Vortex winter of 2013/2014 led to a number of entertaining memes as well as obsessive attention to predictions of local temperatures in the northeastern United States. Temperature is the most common day-to-day measurement. We check the weather report to learn or predict the temperature. We use a thermometer to cook or determine if we have a fever. We do this by bringing the thermometer into contact with the object. If it is an old-fashioned thermometer we use the fact that the liquid in the thermometer will reach the same temperature as the object with which it is brought into contact, and, since we know how much the liquid in the thermometer expands or contracts at that temperature, we can measure the length of the liquid column to determine the temperature of the liquid. More commonly these days we use electronic thermometers that measure changes in resistance that occur in a know material we have brought into contact with the object we wish to measure. In either case we rely on the fact that temperature is contagious, i.e. if we bring one object into contact with another eventually they reach the same temperature. We then use some known property of a material in our thermometer that has been calibrated, be that the electrical resistance or the expansion. So we are really only measuring temperature very indirectly. 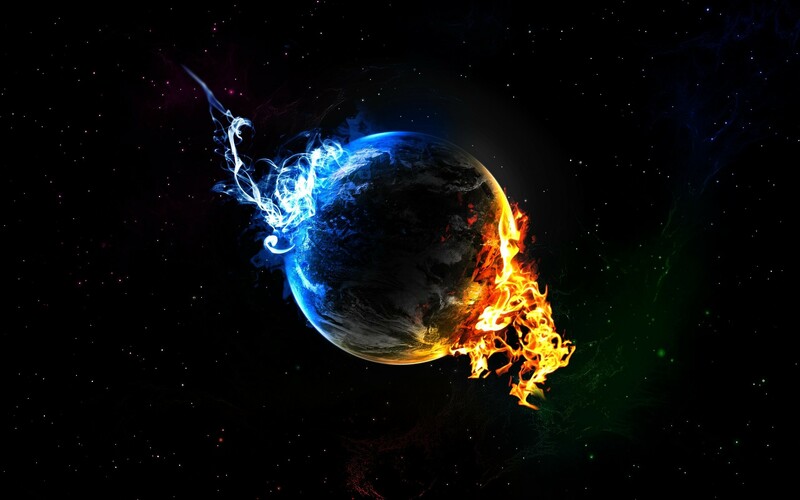 Statistical thermodynamics tells us that temperature arises because most physical systems have a huge number of different possible configurations but only a limited amount of energy. I think of this in analogy to the practice of yoga. In yoga one learns that your body has many possible configurations, and some take considerably more energy to achieve than others. In a physical system energy can usually be moved around from one part of the system to another, but cannot be created or destroyed. We measure the number of configurations available to the system by its entropy. As we increase the energy in a system the number of configurations it can explore increases and hence its entropy increases. If we put two systems in contact then the total system naturally tends toward the most probable configurations that can be obtained by spreading the energy between the two systems. That means that the energy will naturally redistribute itself so the entropy it could gain by adding a bit energy to one system exactly balances the entropy it could gain by adding a bit of energy to the other system. Once this condition is reached there is no advantage to be gained, in terms of reaching a more probable state, and hence a higher entropy, by moving energy between the two systems. 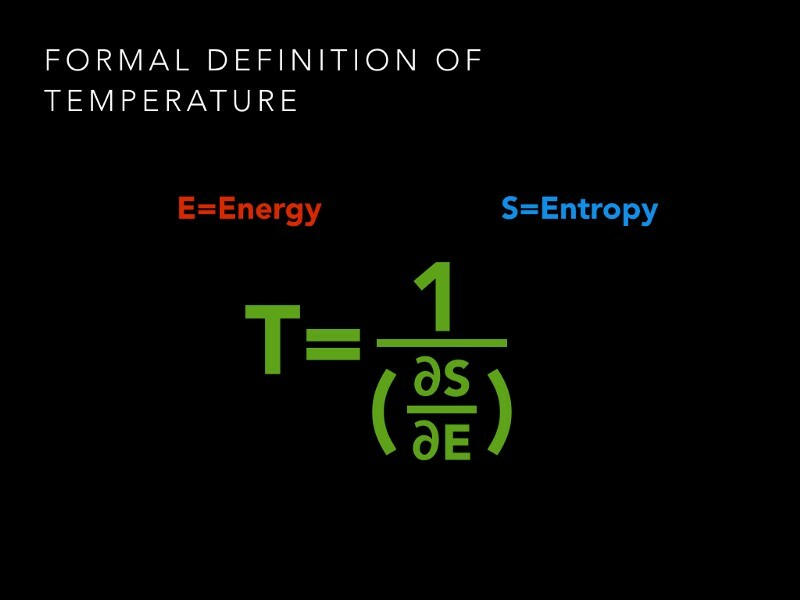 Although our discussion of the meaning of temperature makes reference to the ability of energy to exchange between systems, the definition we end up with for the temperature is totally independent of this fact. It is simply related to how the number of configurations accessible to the system, the entropy, increases as we increase the energy. So as long as a system has energy and has a number of configurations that can be enumerated the system has an associated temperature. In the glass there are strong reasons to believe that we have two such systems. There are the fast motions related to vibrations that contain energy and readily exchange this energy within this system and to the outside world. So when we bring a thermometer into contact with a glass the thermometer equilibrates to this vibrational system and that is the temperature we measure. But we can think of the bond network as another system. The bond network is usually stuck in some configuration that is more-or-less representative of the high temperature at which the glass stopped being in equilibrium, the so-called glass transition temperature. This sub-system can absorb or release energy. This happens when we hold the glass at a high temperature, a process known as annealing. It even happens very slowly when we leave the glass alone, a process known as ageing. In these cases the configurational system rearranges and passes some energy to the vibrational system in an attempt to equilibrate with the vibrational system. It also happens when we apply forces to the glass. In this case we do work on the bonds and force them to reconfigure. Some of this work is typically injected into the configurational system causing it to increase in energy either in a reversible way by stretching bonds or in an irreversible way by reconfiguring bonds. The rest gets passed to the vibrational system. Glasses are composed of a vibrational sub-system and a configurational sub-system. This part about energy being divided between a fast vibrational system and a slow configurational system is not controversial. What we need to establish to be able to say the configurational system has a temperature of its own is to convince ourselves that this sub-system also has an entropy, a number of states it can occupy at that energy. This is not a very far stretch, since the bonds all carry energy and can be rearranged in many different ways. Even in one shard of glass there are a huge number of atoms in various different configurations that could be re-bonded in many different ways; some of these rearrangements manage to maintain the same total energy. The problem is that although this system has a temperature in a formal sense, we have no reason to believe this temperature is in equilibrium with the other relevant temperature. For this reason we need to carefully describe the equations that describe under what conditions the configurational system would pass energy to the vibrational system and “cool” and under what conditions we could inject energy into the configurational system and cause it to “heat”. Here cooling would denote moving to a lower energy, more stable and less disordered configuration. This is known to occur in glasses all the time by a process known as aging, and this process can be sped up by heating the glass in a process known as annealing. Heating would denote moving to a higher energy, less stable and more disordered configuration, which can be achieved by imposing mechanical stresses on the glass structure, causing bonds to rearrange. STZ continuum simulation of a shear band in a lamellar metallic glass/nanocrystalline composite by Adam Hinkle with code by Chris Rycroft. STZ continuum simulation of fracture in a metallic glass with cavitation at a critical tensile pressure by Eran Bouchbinder and Chris Rycroft, Phys. Rev. Lett. 109, 194301 (2012). The devil is in the details, and I will not go into those here, but by choosing a very simple set of assumptions about the ways the system is able to rearrange itself through regions we call “shear transformation zones” or STZs it is possible to use this two-temperature idea to create a robust and thermodynamically consistent theory to predict the behavior of the glass subjected to mechanical forces. Here I show a simulation of the initiation of a shear band under a simple shear load performed by Adam Hinkle, a Johns Hopkins Ph.D. student using a code by Chris Rycroft from Harvard University. I also show the result of some simulations done with the same code by Chris and a colleague Eran Bouchbinder of the Weizmann Institute that show the fracture of a metallic glass specimen. In this case they had to add the physics of bubble formation, a process referred to as cavitation in the technical literature, that we have also been studying using atomic scale simulation. Their fracture simulations show at least qualitative correspondence with experimental results. Michael L. Falk is a professor in the Materials Science and Engineering Department (joint appointed in Mechanical Engineering and in Physics and Astronomy) at Johns Hopkins Whiting School of Engineering in Baltimore, Maryland.